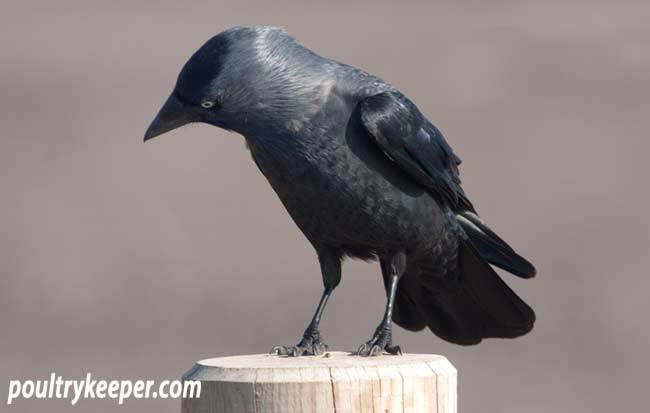 Crows and Rooks can be very damaging to your birds. Chickens or ducks that are sitting on a nest, or have young and are not enclosed are particularly attractive to them, however they will also take fully grown birds on occasions. I have even heard of full-sized Indian Runner Drakes being killed by crows in the early hours of the morning during the summer months, forcing the owners to house their ducks at night. Crows live in pairs and are territorial birds so if you remove one pair, others will often move into their territory. Crows can quite remarkably pick up on your routines quickly and will soon learn when it is safe to move in closer to your birds. 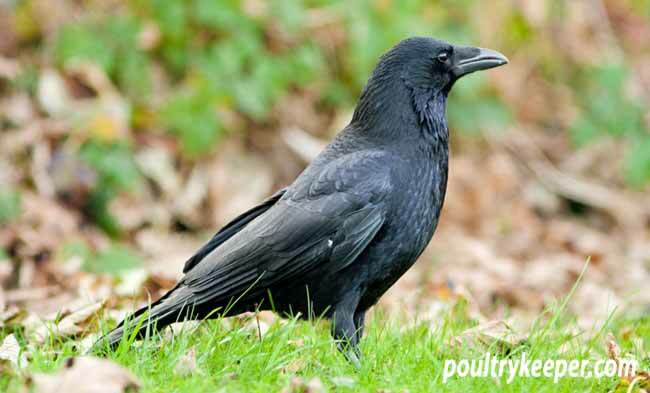 A crow like this one can take eggs, young stock and even adult birds. Crows will attack a bird by tearing at the flesh. 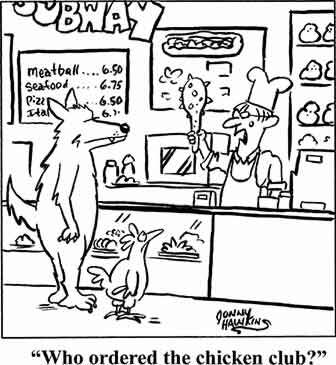 They will kill chicks / ducklings, growers or other small birds but will leave the dead bird, coming back to eat it again later. They may carry small chicks and ducklings off if they can manage them. Crows and Rooks are not usually a problem all year round but can sometimes be a nuisance around May – June when young birds are let out for the first time to free range and the crows have young to feed. Once they start killing birds, they will come back at the same sort of time every day so it is important to know when this is if you plan to shoot them. Crows will not usually take food. If they do, it is not usually much, it is usually a very fast visit. They prefer the birds themselves! Sometimes there is a problem with rooks taking food though. Whilst this may seem harmless enough, this can develop into quite a problem. For a start, you won’t know how much food your birds are getting themselves and these gate-crashers will soon invite their friends until you are feeding many beaks. Rooks will usually arrive in pairs or more and will even go into poultry houses to feed, taking turns to keep watch and eat. Bio-security is also a problem, it is never wise to have wild birds visiting as they can carry disease into your flock. The best protection from crows and rooks of course is a covered run and keeping birds housed until there are people around during the mornings but failing this, a shotgun is the best way to dispatch them. You will of course need a suitable licence if you are the one going to do the shooting and a good hiding place, they have very good eye sight! Shooting Foxes to Protect Poultry has more information about the types of license required in the UK. Some people believe that hanging a dead crow by a string nearby will put them off, I have never tried this myself. CDs hung in various places that move around and reflect the light can work to scare them but they do get used to them being in certain positions after a while, so they will need moving from time to time. If you would like to lure the crows in to shoot them (say for example if you have somebody coming over to shoot them) then a large plastic owl can be effective. They will swoop in to attack the owl and then can be shot. Leaving part of a rabbit carcass out also attracts crows. They will land to tear at the rabbit and again can be shot. If you are shooting rooks, the first shot will scare them away but they will watch from a tree top at a safe distance and then return once you have left. When a crow is shot, the second crow in the pair will swoop over the dead one and usually screech alot. This is a good opportunity for you to shoot the second one although if you don’t, it will not remain in this territory, it will leave so should not continue to be a problem. Crow traps can be bought or made. 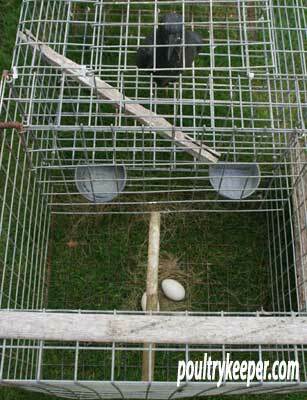 A ‘Larsen Trap’ (after the name of the inventor) can be used for crows or magpies. They consist of two or three cages side by side with sprung doors on the top of one or two of them. One has a live crow or plastic dummy crow in it to attract other crows, the other, two sticks propping the sprung lid open and an egg or two to tempt the visitor in. Larsen traps can also be used for Magpies who can also steal eggs from nests as you can see in the video clip I took for my article on Magpies Stealing Eggs. When the crow goes into the trap, he lands on the sticks which come apart and trigger the sprung lid to close and the crow is caught inside the trap. When you have caught a crow, it must be dispatched humanely, or if using the ‘live crow as bait’ method, swapped with the decoy crow which then can be dispatched. Remember to wear thick gloves when handling crows and cover the entrance with a blanket or net as you open it because they can spot an opening and will try to escape. Remember: You must provide food, water and shade if a live bird is used as the decoy and only keep it in the trap for a reasonable length of time. The trap must be inspected daily. An alternative solution for rooks is a rook trap. You start by knocking 4 posts in the ground (finished height is not critical) just deep enough to hold them in the ground securely. Place them 4 feet apart (the width of your roll of chicken wire). Next, take the chicken wire and cover the sides, leaving one edge free so that you can tie this with string (you need to be able to get in / out of the trap). Fix two of the shorter posts parallel to one another across the top of the trap between two pairs of posts. Now, take the gravel boards (these are boards about 4 inches tall that you see at the bottom of fences). Fit a parallel pair of gravel boards across the top of the trap with a 4 inch gap (a slot) between them. Cover the remaining roof area with mesh but not the 4 inch slot. Place a loaf of bread that has been wet on the edge of a board on top of the trap. Place more bread inside the trap (the same sort). The rooks will not touch the bread on top of the trap at first but once they are used to it, they will land on the boards and tear at the loaf. As they do, the bread will fall apart (it’s wet) and pieces will fall into the trap through the slot. Eventually, the rooks will go in to the trap to get the remaining bread. They cannot get out of the trap since they have to fly to get to the slot and their wings are spread making them too big to fit through. Rooks will keep going into the trap, so don’t empty it immediately. If you don’t have an air rifle, a batton of wood can be used to dispatch them. They will not fly in your face as in the horror movies!